Here’s what’s up in the world of TV for Monday, March 4. All times are Eastern. 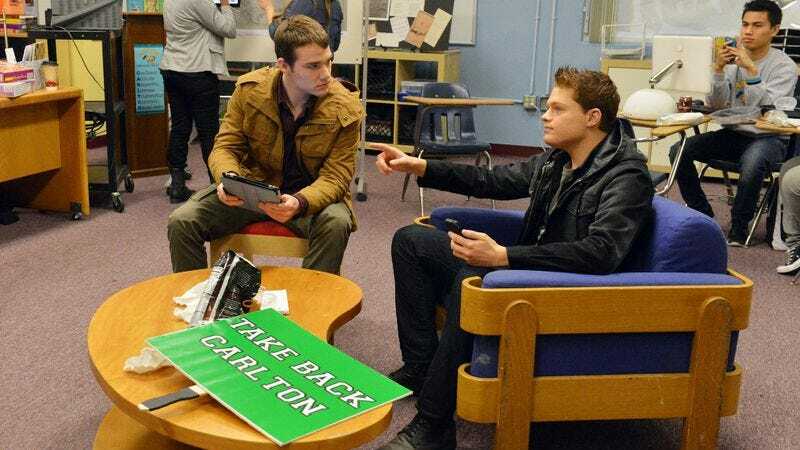 Switched At Birth (ABC Family, 8 p.m.): With just two episodes left in this half season—and the show’s future coverage here on the line—we’re going all in on tonight’s episode, which will be performed entirely in American Sign Language. You probably don’t even need to get all caught up! Just watch to see an American television show performed in a language other than English. Watch to support television doing things other than the same, boring old stuff! Carrie Raisler will be on the barricade. Who will be strong and stand with her? Adventure Time (Cartoon Network, 7:30 p.m.): A new episode entitled “The Great Birdman” reminds us of that hoax video where it looked like that eagle was going to make off with that baby. Oliver Sava once fought off a host of the mighty Thunderbirds with nothing but his bare fists and a length of garden hose. The Carrie Diaries (The CW, 8 p.m.): Tonight’s episode is directed by Amy Heckerling, which should make you a little sad. Remember all those great movies she was responsible for? And now she can’t seem to get anything greenlit? Carrie Raisler is going to head down to the tracks and pour one out. Regular Show (Cartoon Network, 8 p.m.): In this episode, our heroes help an ‘80s sitcom star on his improbable quest. Alasdair Wilkins once got into this very situation. It involved a covered wagon, a pack of wild dogs, and Tony Danza’s impossible dream of building a giant statue of himself out of soda cans. The Following (Fox, 9 p.m.): So as it turns out, Joe’s “big plan” involved suing under his eighth amendment rights, which is a little more paperwork-y than we were expecting his big plan to be. David Sims considers it a bit of a missed opportunity that his big plan didn’t involve lots of stabby action. RuPaul’s Drag Race (Logo, 9 p.m.): The queens have to apply makeup in the dark, which seems like a challenge to us. There are very few things we can go in the dark. Honestly, most nights, even walking is a massive challenge for us. Oliver Sava uses this to his advantage to skitter around on our ceilings at night. Peep Show (11 a.m.): Phil Dyess-Nugent begins his look at the great British sitcom by going all the way back to season one. The show just finished its eighth season, so you’re going to have at least eight weeks of coverage of this! Nah. We’re just kidding. More like 24! Seriously, those seasons are short. Batman: The Animated Series (1 p.m.): Catwoman’s being chased by a “cat cult,” which sounds like the sort of thing that probably happens to her on a daily basis. Honestly, if we were making a show about Catwoman, she’d never stop dealing with cat cults. Oliver Sava is in a weird cult that worships Heathcliff. Are You Tougher Than A Boy Scout? (National Geographic, 8 p.m.): No. The Bachelor: The Women Tell All (ABC, 8 p.m.): Realize just how empty any hope you might have for true love ultimately is by watching as all of the women the current Bachelor—whose name may or may not be Sean; we can’t be sure—has rejected in his casual course of ultimate terror and heartbreak. LA Shrinks (Bravo, 10 p.m.): Molly Eichel checks out Bravo’s latest reality series—this one about a bunch of people trying to help others with their mental well-being in the city of Los Angeles, if the title didn’t tip you off to that immediately—and we’re certain it’s a piercing look into the human soul. And stuff. The Staircase (Sundance, 10 p.m.): The absolutely riveting documentary miniseries about a murder case recently completed a rebroadcast of its original eight episodes, and now, it’s broadcasting the two new episodes that catch viewers up to what’s happened since the original began. Josh Modell checks it out. Goodbye, Mr. Chips (TCM, 8 p.m.): We’ve never seen this movie. We figure we probably should, since it’s so beloved, particularly by British people. Robert Donat won the Best Actor Oscar for his work as the titular Mr. Chips. Sadly, we don’t think anybody says, “Goooodbyyyye, Mr. Chiiips” at any point. Heaven (Flix, 9:40 p.m.): Cate Blanchett stars as a woman who longs to avenge the death of her husband and, naturally, finds that these sorts of things tend to backfire. The script is by the great Polish director Krzysztof Kieślowski with direction by Tom Tykwer, in case you needed to be convinced. College Basketball: Baylor vs. Texas (ESPN, 9 p.m.): As March Madness draws ever nearer, two Texas schools face off in hopes of maximizing their placement in the brackets—or placing in the brackets at all. Baylor won the last meeting between the two, but in overtime, so we’re expecting something terrific. The Simpsons (Sunday): Robert David Sullivan gave this episode a B-, which is pretty good for latter-day Simpsons, and we really like the promotional image used in the article, which involves Grampa Simpson ending up in some sort of “Emperor’s New Clothes” scenario. Yes, but does he have a new groove?